On the 25th anniversary of the pink ribbon, we’re not celebrating. We’re angry. Angry that a quarter of a million women are diagnosed with breast cancer each year. Angry that more than 40,000 women die each and every year. And angry that women of color and underserved communities are disproportionately burdened. There is too little to show for 25 years of pink ribbon awareness and billions of dollars spent on pink ribbon products. The pink ribbon is one of the most widely recognized symbols, and breast cancer awareness has ballooned into a multibillion-dollar industry. This October, we’re calling out The Estée Lauder Companies, a global cosmetics corporation, for their role in launching the first pink ribbon. Twenty-five years later, we are telling Estée Lauder it’s “Knot Our Pink Ribbon” — and we’re putting a knot in theirs. Twenty-five years ago, there was no pink ribbon. But there was a peach one, started by grassroots activist Charlotte Haley that focused on prevention and political action. 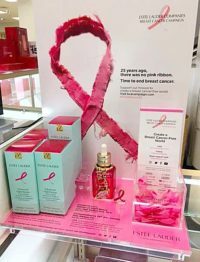 Estée Lauder’s pink ribbon began with a stolen idea—and when they turned the peach ribbon pink, they shifted the focus to marketing, awareness, and corporate gain. Pink ribbons have hijacked the movement and erased the real work and meaningful action needed to address and end the breast cancer epidemic. Estée Lauder has distributed more than 150 million pink ribbons at their beauty counters and illuminated more than 1,000 landmarks around the world “to raise awareness.” But awareness that is not part of a larger push for systemic change is not useful, and in fact can be an impediment. The time, resources and money could be better spent on meaningful change. After all, who isn’t aware of breast cancer today? It’s time for meaningful action so that fewer women are diagnosed with breast cancer and fewer women die. And it’s time to eliminate the gross inequities in breast cancer. Estée Lauder tells women facing breast cancer to “choose happy,” “laugh often,” and “smile.” Their website and social media platforms are filled with pink flowers and soothing tips suggesting that with the right attitude and beauty products, we can all become better, more beautiful breast cancer patients. Estée Lauder says “Having gratitude and a positive attitude can always help.“ But we know that no amount of positive thinking will prevent women from being diagnosed with and dying from breast cancer. It’s time to stop blaming women for their breast cancer, or telling them the “right” way to go through cancer, and instead honor the diversity of women’s lived experiences. 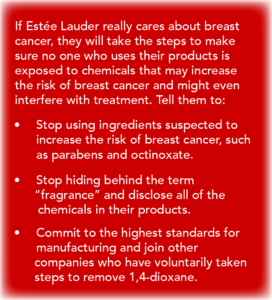 Estée Lauder tells us to buy their products because they care about breast cancer. But many of their cosmetics contain chemicals of concern such as hormone disruptors that may increase the risk of breast cancer and might even interfere with treatment. We call this pinkwashing. And it’s time for companies that care about breast cancer to stop pinkwashing. ISN’T THERE ANYTHING GOOD TO SHOW FOR THE PINK RIBBON? Estée Lauder is proud that in the past 25 years they have donated $70 million for global breast cancer awareness, research, and education. Some might argue that’s a lot of money, but last year’s donation was just half of 1 percent of annual earnings! That’s a tiny amount to spend to get so much positive media exposure and brand recognition. Pink ribbons are a great marketing tool. But they aren’t a great way to stop women from being diagnosed with breast cancer, eliminate the unacceptable inequities, and keep women from dying. 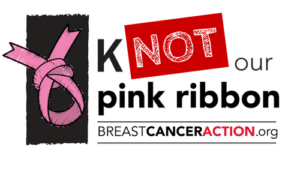 Join us in putting a knot in Estée Lauder’s pink ribbon. For more information, read our campaign brief by clicking below or download the PDF by clicking here.